Did you know... Radiation instruments (radiometer, pyrgeometer, and pyranometer) have a device inside, which converts thermal energy to electrical energy. These instruments receive both shortwave and longwave radiation. 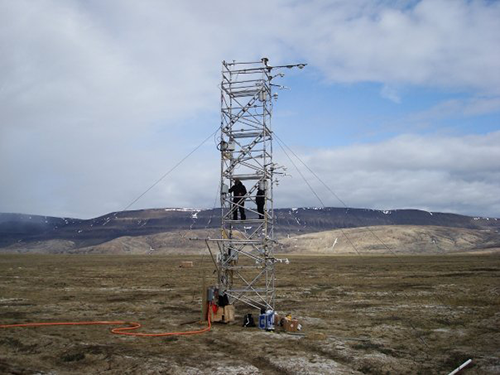 The PSD Polar Observations and Processes team and Environment Canada erected a 10.5 m flux tower in Eureka, Nunavat, Canada in 2007. At the top, we installed upwelling/downwelling shortwave and longwave radiation instruments . Downwelling instruments are facing up, measuring solar radiation from the Sun, while upwelling instruments are looking down, measuring radiation from the ground. Kipp and Zonen CM22 radiometers measure shortwave radiation, while Eppley PIR radiometers measure infrared radiation. The six-panel plot on the right shows the tower shortwave (SW) and longwave (LW) radiation data (61 minute running average) in 2009. Units are in W/m^2. The bottom right plot shows albedo, calculated by dividing SW upwelling by SW downwelling. melting snow during the Arctic spring/summer lowers the albedo from near 1 in the spring to close to 0 in June when the ice is mostly melted. Large noise seen from October-April shows the evidence of long winter in arctic. During this period, longwave radiation dominates. Instruments are detecting very small upwelling and downwelling SW signals. When you divide a very small number by a very small number, it fluctuates very wildly!